When we started the Digital Currency Initiative (DCI) at MIT, our goal was to create an environment that enabled diversity of work and thought on cryptocurrencies among students, researchers and open-source developers. 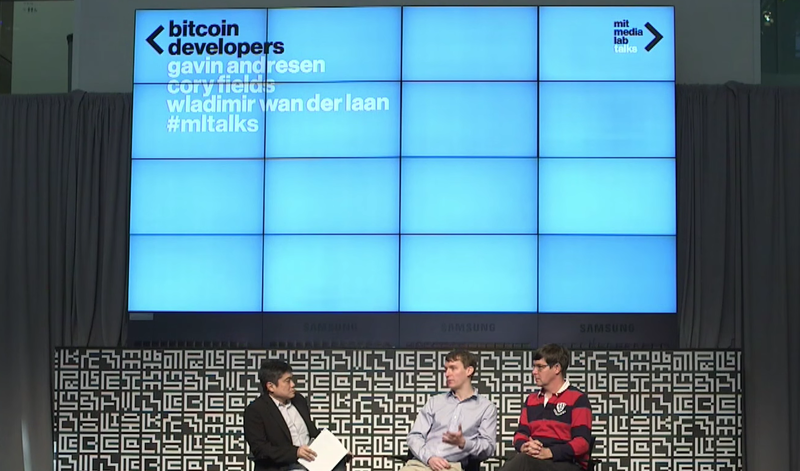 Amidst block size debates and proclamations that Bitcoin is dead, we’re glad the first action we took was to offer positions in a neutral academic environment at the MIT Media Lab to Wlad, Cory and Gavin to continue their open-source development work on Bitcoin. When we offered these positions, we heard from companies and individuals with offers of financial support, which led to the creation of the Bitcoin Developer Fund. The goal of the fund is to cover salaries, travel and overall support of Bitcoin protocol development efforts, including events like the Scaling Bitcoin workshop series. Together, we’ve raised $900,000. Donors include companies (BitFury, Bitmain, Chain, Circle and Nasdaq) and individuals (Jim Breyer, Jim Pallotta, Jeff Tarrant, Reid Hoffman and Fred Wilson). Several of our donors asked to donate in bitcoin, and we’re proud to say that MIT, for the first time, created a wallet to accept bitcoin from donors for this fund. It’s important to note that these donations are made as unrestricted gifts. This means that, while the funds will be limited to support Bitcoin protocol development, the donors do not have any influence over the developers. Lastly, nothing has changed for Cory, Gavin and Wlad — the goal of this announcement is to publicly recognize the sponsors and address questions people might have about the fund. How much are the developers paid? As a policy, MIT does not reveal the salaries of employees, but they are within the appropriate range for employees of academic institutions. Will you support other developers who work on Bitcoin? We’re open to supporting another Bitcoin developer if there is a real demonstrated need. We also encourage other universities to house developers so as to not centralize their employment at any one institution. In doing so, the academic community can help build a robust community of engineers to support the development of Bitcoin and other promising cryptocurrencies. Is the DCI in favor of Bitcoin Core or Bitcoin Classic? To be clear, the DCI’s goal is to support diversity of thought in the Bitcoin space. The establishment of this fund enables us to offer positions in a neutral academic environment. This allows developers like Wlad, Cory and Gavin to work on code and develop new ideas that may be controversial, but can do so with the assurance that they won’t be fired for diversity of thought. Similarly, staff, students and professors of the DCI have differing opinions about Bitcoin Core and Bitcoin Classic, but the DCI as an initiative is not in favor of one over the other. Will the money be used to pay the administrative costs of the DCI? No. The money will not be used to pay for any administrative costs of the DCI. The DCI is supported separately by sponsors of the Media Lab, similar to how the other research groups at the Lab are funded. Will you support open-source development of other cryptocurrencies? This fund specifically applies to the development of code for the Bitcoin protocol. However, where there is a strong need and potential sponsors, we are open to talking with other open-source cryptocurrency projects about developing a separate fund. Do you influence what the developers work on or the positions they take? No. We make no directives to developers on what work they should do or the positions they should take on policy decisions. For anyone following the current discussion about the block size, that’s probably already apparent seeing that Wlad, Cory and Gavin have expressed differing points of view. Does MIT own the copyright to Bitcoin code? For existing projects contributed to by MIT employees, patches are made respecting the project’s license. Bitcoin uses the MIT License. Therefore, the developers’ work is under the MIT License held by the developers (this does not mean that MIT has any control over it, but rather that it is under a non-restrictive license). New projects started by MIT employees may also be released under permissive use licenses — such as GPLv2, MIT or BSD — at the discretion of the developer. MIT does not typically allow for projects to be started with certain open-source licenses — such as Apache or GPLv3 — but members of our group have been pushing to eliminate these restrictions. How long does MIT intend to maintain this fund? As long as there is a need to provide a home for developers of the Bitcoin protocol and there are funders that will support it. Do the developers physically work at MIT? No. They are free (and welcome to!) work from MIT at any time, but they mostly work remotely. What does MIT consider to be a Bitcoin developer? In our opinion, a Bitcoin developer is someone who has made major contributions to Bitcoin software and development. How were the developer hiring decisions made? Why aren’t you supporting ___? The three developers were offered positions when the Bitcoin Foundation could no longer support them. As other developers seemed to have functional arrangements, they were not offered positions. Are the funds donated in Bitcoin being kept in Bitcoin? No. MIT liquidates the funds into U.S. dollars.